Paying for healthcare is generally seen as a bad thing in the UK. The free-to-access National Health Service is so ingrained into our culture that shelling out to see a doctor is regarded as something only rich people or those desperate to skip a long wait time will do. Push Doctor is a new service that may change that thanks to its sheer convenience. Similar to US services like Doctor on Demand and MD Live, Push Doctor connects users with a qualified doctor who can do anything their local general practitioner can do, as long as it doesn’t involve a physical examination. They can issue prescriptions, referrals and sick notes, and even feed back information to your family GP’s records if you choose. Security-wise, the company says that the video link is encrypted and nothing is recorded – it’s trashed once the call is finished. The only difference from a normal consultation – aside from the convenience of being able to do it anywhere you like via your computer, smartphone or tablet – is that you pay. A 10-minute consultation costs £20, 20 minutes will set you back £40, while the maximum 30-minute slot is £55. I tried Push Doctor and it worked well. After signing up for an account, I booked a 10-minute appointment. You can choose to see a doctor as soon as possible or book a slot for the future. I chose the former option and only waited three minutes before I was connected with a nice GP called Dr Brennan. I talked Dr Brennan through my problem and despite it not being a particularly scary ailment, she gave me the full time I’d reserved, explaining the different available treatment options in detail. Had I chosen to take a prescription, I had the option of receiving it by email and printing it out to take to a pharmacy, or waiting for it to arrive by snail mail. There was a problem in that despite me being pretty sure I shut off the stream just before the timer hit 10 minutes, the statement I received afterwards clocked the call at 10:05 and billed me for an extra 10 minutes, taking me into the £40 payment bracket. Luckily I was using a free test account provided to me by Push Doctor, but this is something the company (and users) will need to keep an eye on. (Update: Push Doctor tells us that there is a buffer in place to avoid this happening, although it doesn’t happen on free accounts. So, this issue shouldn’t occur if you pay). 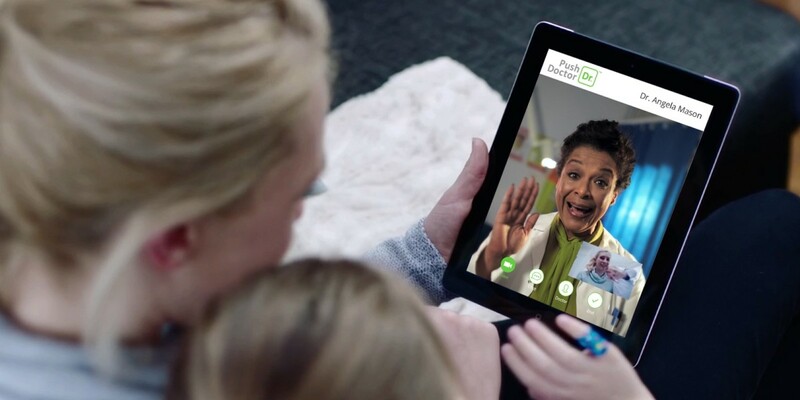 Push Doctor’s founder and CEO, Eren Ozagir, says that his service is about encouraging a mass population to better engaging with their health by offering an e-health service with an easy-to-use, consumer-focused interface. He gives a real-life example of a woman who has found peace of mind because her husband, who doesn’t like to visit a doctor, is more likely to get problems seen to as he can do it at his own convenience. What about the payment angle? Isn’t offering a mass-market, paid healthcare product at a time when the NHS is experiencing wide-ranging cuts potentially controversial? Ozagir, who was previously Chief Commercial and Marketing Officer at online retailer MusicMagpie, doesn’t believe so. He says that private GP appointments in the UK are already a £1 billion ($1.5 billion) market, and Push Doctor is merely making that more accessible to the masses. The company is keen to point out that it’s not taking doctors away from NHS service, they simply work for Push Doctor during their existing private consultation time. There’s even a Push NHS service that allows GP practices and NHS trusts to offer online video consultancy. Given the continuing debate around GP waiting times, this is a potential boon for both health providers and the public. As a Brit who is proud of the NHS, I have a little voice in the back of my head that worries if Push Doctor is a big success it could be a good excuse for the government to cut back healthcare funding even further. Still, a doctor in my pocket? The sheer convenience is a winner for me.